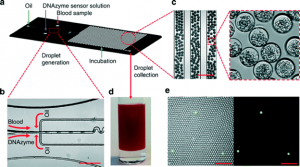 Integrated Comprehensive Droplet Digital Detection, or IC 3D, is an exciting new technology developed at UC Irvine in the laboratory of Weian Zhao and is being commercialized by the diagnostics startup, Velox Biosystems, LLC. 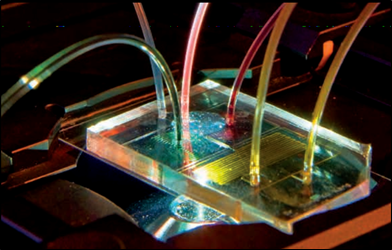 The technology was recently featured in the prestigious academic journals, Nature Communications and Lab on a Chip. IC 3D provides a tool to detect a single pathogen in a several milliliter sample in less than an hour. The combination of this speed and sensitivity in an unprocessed sample represents a huge leap forward in diagnostic technology. Applications of IC 3D are broad, including cancer detection & monitoring, infectious disease testing, water & food sampling, and biowarfare agent detection. The technology works by partitioning a sample into hundreds of millions of picoliter sized droplets using a microfluidic cartridge. 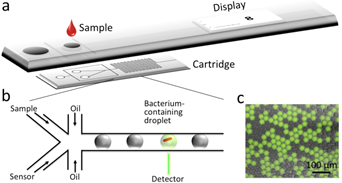 The compartmentalization of a single pathogen in a picoliter-sized droplet significantly increases the concentration of target molecules in that volume, permitting rapid detection of as little as a single bacterium in a 1-5 ml sample. The partitioned samples can then be combined with biosensors that fluoresce when the appropriate cell markers are detected. No sample processing, culturing, or amplification is necessary. Figure 2. Diagram of IC 3D, an automated, portable device for routine pathogen detection and screening. Any sample, such as blood, water, or food, can be analyzed and the number of target bacteria in the sample will be shown on the display panel within one hour. Figure 3 (a) Device layout for the droplet-based microfluidic device. The device has 3 inlets: one oil inlet, and two inlets for blood samples and the DNAzyme/bacterial lysis buffer. (b, c) Microscopy images showing the formation of uniform 30 μm droplets that consist of 10% blood and DNAzyme/bacterial lysis buffer solution. Scale bar, 200 μm. (d) Collected droplets in a cuvette for counting with a 3D particle counter. (e) Fluorescence microscopy images indicating that after a 3 h reaction, DNAzyme sensors light up droplets containing single E. coli K12 bacterium in 10% blood. Left panel: overlay of fluorescence and bright field images. Right panel: fluorescence image. Scale bar, 200 μm. The portability of the device allows easy deployment to clinics and other remote locations. The process of sampling and detection is simple enough that it is significantly cheaper than existing diagnostic testing platforms. Velox Biosystems has patented this cell and molecule detection technology and is pursuing applications in multiple industries, including healthcare, food safety, and water treatment. This technology has the potential to revolutionize how we detect and analyze rare pathogens (bacteria, virus, and fungus) in any medium, whether it be human samples, such as blood & sputum, food samples, or public water supplies. Two clinical trials are underway using the IC 3D platform: one for antibiotic susceptibility testing, and the other for cancer detection & monitoring. Velox Biosystems was formed in 2014 to commercialize the IC 3D technology and is actively seeking new partnerships.